The Brazen Hussy is also equipped with a Magnetometer which is able to search for any objects lost below provided they have a ferrous content in any of the metals of that object. 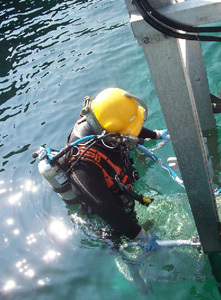 Due to our long history as a dive boat we have a number of professional divers we can call on to assist in dive operations and should the necessity occur, we are able to provide R.O.V. cinematic or televisual coverage of an area or object that the client is interested in.